Looking over docklands on a hot summer day - the view here is amazing (Carr, 2017). It’s been almost a year now since Waterfront Toronto announced that Sidewalk Labs – a subsidiary of Alphabet Inc. (formerly known as Google) – won the international competition to develop Quayside, a derelict piece of land located at the bottom of Parliament Street, wedged between Lake Ontario and the Gardiner Expressway. A media storm ensued around the world(1), announcing that Google was getting into urban development, and rightly so. After all, why would a company that runs an annual revenue of roughly 110 billion (Alphabet, 2017: 5) based on advertising (Fuchs 2017; Glowik, 2017), or as Bilić (2018) called it “algorithm capitalism”, get into urban development? Or more urgently: In what ways does this challenge other modes of urban development? It is perhaps not surprising that many are waiting with baited breath in anticipation over what it is that Sidewalk Labs will, in fact, build. So far, Sidewalk Labs maintains that, in partnership with Waterfront Toronto, it will develop Quayside into the best smart city ever, learning from past urban planning projects, and building improvements into the design. This joint effort is called Sidewalk Toronto (not to be confused with Sidewalk Talk)(2). Quayside will be environmental with climate positive passive buildings, which will be flexible and multi-purpose. The garbage will also be automatically removed, smart cars will efficiently ferry people about, and sensors will monitor air pollution and traffic. Quayside will also be social: Development will be participatory and harnessing diverse inputs. To this end, Sidewalk Labs has already engaged a series of Public Roundtables, Public Talks, Neighbourhood Meetings, Workshops, Design Jams, Civic Labs, Kids Camps, and more in what is termed interacting with the neighbourhood (Aggarwala, 2018). Housing will also be affordable and residents will profit from a system that integrates health services. With the aid of the celebrated “single unified platform” Quayside will also help the government be more efficient (reducing the costs of government and the amount of taxes that each citizen will have to pay), providing data about crowd control, issuing per-click governmental permissions, and generally easing bureaucratic processes that are traditionally scattered across different public institutions in different, often incompatible, data formats (Sidewalk Labs, 2018). Best of all, this digital district that will be “private by design,” (Sidewalk Labs, 2017), drawing upon a “developed in Canada” philosophy of privacy developed by the renowned Professor Ann Cavoukian at Ryerson University. See Sidewalktoronto.ca for a trove of information about development at Quayside, including interviews, videos, calendar of upcoming activities, reviews of past events, press releases, and image galleries. Browse through the appendices of their Feedback Reports or lists of English language media coverage. In short: Sidewalk Labs assures us that Quayside is going to be amazing. The question is only: How amazing and for who? Sidewalktoronto is definitely a departure from business as usual developer-led urbanization in the city. If its commitment to state-of-the-art design doesn’t ring out remarkable, then its apparent readiness to interact with Torontonians ought to strike a new chord. However, there are many unanswered questions, and we are certainly not the first to notice the gaps in information (see John Lorinc's work at spacing.ca). As urban scholars, we very much appreciate these concerns, and are interested in following Quayside because it has the potential to be a game changer in how we understand the political economic production of cities. There are many uncertainties associated with Quayside, in particular, and digital cities in general. While the digitalization of urban spaces (broadly conceived) can potentially offer benefits, a number of unresolved or emerging challenges are easily identifiable, especially in respect to the over reliance on tech companies and their products, reliability of data production and corporatized data infrastructure, and not least urban governance, data ownership, and data sovereignty. It is well-documented that smart cities have been heavily pushed by tech companies who view digitizing urban environments as a burgeoning market for their products (Kitchin 2015). Kitchin (ibid.) notes that this possibly comes along with a number of undesirable externalities: a) the commodification of public services, as city services are administered for the benefit of private profit; b) technological lock-in effects that can be not only be difficult to reverse, but may also render the city less resilient as it fights bugs, viruses, crashes, and hacks; and, (c) digitalization endorses processes of standardization that overlook specificities of place (a case of policy mobility, actually! see Carr, 2013), and fixes municipal administrations to narrowly defined technocratic modes of digital governance. Others observe that there is a need to understand the epistemologies behind the production of big data, algorithms, digital technology design, (Ash et al., 2016): Data is not value-free (Kitchin 2015). Rather, they are indicative of end processes of political ideologies (e.g. neoliberal urban agendas), and the associated methods and processes of framing that structure the production of data. One might search out, for example, how algorithms are informed by and then reproduce socio-economic inequalities, or how far the resulting corporatization of city services resemble technological solutionism (Ash et al., 2016). Ash et al., (2016) refer to the work of Graham and Shelton (2013) who identified data shadows, “where groups who are considered valuable are increasingly data mined, while other populations are excluded from analysis,” (Ash et al. 2016: 34). “the need to examine the ownership and control of data; the integration of data within urban operating systems, control rooms, and data markets; data security and integrity; data protection and privacy, data quality and provenance and dataveillance.” (Ash et al., 2016: 37). On this level, one might find inspiration from projects like NetHood or MAZI that aim to democratise data collection by promoting technological literacy and seeking out ways that data generation/collection can be performed by and for neighbourhood communities. In any case, these are all extensive debates – and they are hardly only relevant debates(!) – that are unfolding across various fields of social science, which ought to be considered before or alongside developments at Quayside. This entry of Urbanization Unbound will start simple, and unpack some of the links between Alphabet, Google and Sidewalk, and who/what is promoting the activities at Quayside. An interesting encounter of the … kind? 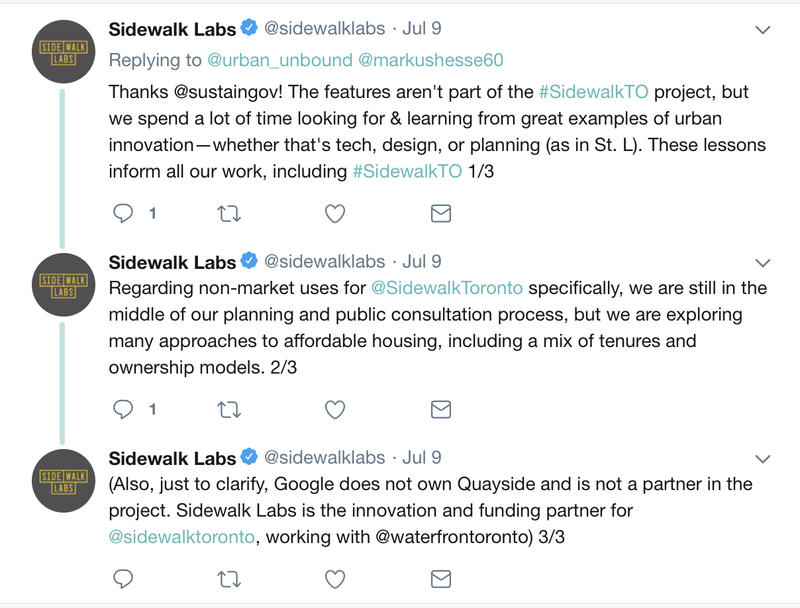 And, minutes later, Sidewalk Labs responded, outlining some development intentions and correcting me on its business structure. As an urban geographer that has focussed on other issues of developer-led urban transformation, it hadn’t been high on my priority list to examine the precise structure of Alphabet Inc. But, okay, the oversight was indeed mine. “I want to reiterate: We are not a tech company!! We’re different. We combine that belief that cities are a combination of, yes, a set of technologies and a place in geography, but a community of people,” (Aggarwala, 2018). In his view, it was essential to understand that when Waterfront Toronto put out its call for proposals, it was out of the plain love of city building that Sidewalk responded (Aggarwala, 2018). Still, let’s back up and clear some things up with a bit of cursory research. Back in 2015, Google Inc. announced that the company would be structured such that the incorporated Google would be transformed into a limited liability company and become a subsidiary of a newly created public holding company. Headquartered in Mountain View, California, Alphabet Inc. (3), became the new parent company of Google LLC and a myriad of further subsidiaries – sister companies to Google LLC, that is. There are many illustrations across the net that attempt to explain the structure – It is hard to be sure, however, which ones are well researched, accurate, complete, and up-to-date. Financially, Alphabet Inc. is divided into two "segments,"
“[Alphabet’s] segments include Google and Other Bets. The Google segment includes its Internet products, such as Search, Ads, Commerce, Maps, YouTube, Google Cloud, Android, Chrome and Google Play, as well as its hardware initiatives. The Google segment is engaged in advertising, sales of digital content, applications and cloud offerings, and sales of hardware products. The Other Bets segment is engaged in the sales of Internet and television services through Google Fiber, sales of Nest products and services, and licensing and research and development (R&D) services through Verily,” (Reuters, 2018a). Listed as GOOGL (Class A, one vote each) or GOOG (Class C, no voting rights) on the NASDAQ(4), stock values have nearly doubled since the day that Alphabet Inc. was founded, October 2, 2015. In the second quarter of 2018, Alphabet announced 32.657 billion US Dollars in revenue, 32.512 billion of which was generated by the larger of its two segments, Google (Alphabet 2018: 2-3). It’s fair to say that revenues from Alphabet’s Google segment constitute a large portion of Alphabet's earnings – like 99.5559%. Rounding it up to 100%, however, would occlude the remaining 145 million $US generated by Alphabet Inc.’s smaller segment that is aptly named, Other Bets. Companies listed in this portfolio include the Google X moonshot factory projects, Verily (healthcare, smart contact lenses, glitter-sized biomarkers), Calico (biotech, curing aging), GV (a venture capital fund), Chronicle (cybersecurity), DeepMind (AI development), Waymo (self-driving cars), Access (internet provider), Loon (internet balloons), Wing (delivery drones) (5), and Sidewalk Labs and Sidewalk Talk (based in NYC), and Sidewalk Toronto (6). In investor circles, stocks in Alphabet Inc. are among the most closely watched. Small wonder, given that the return on investments have been on the scale of 25-30% per year, a yield that could dwarf the appreciation of single pieces of property – even those in downtown Toronto (7). And while bullish returns have delighted investors, some note that Google’s – ehm Alphabet’s – returns are not as strong as others from the so called FAANG group (Facebook, Amazon, Apple Netflix, Google). These investors wager that Alphabet Inc. is playing the long game trading off short term gain for possible longer term returns associated with these… other bets. So, it seems that Sidewalk Labs is, in the first instance, one of Alphabet’s gambles. And by extension, the ca.100 strong labour force working there are in charge of upping their odds and maximizing their winnings. In an of itself, this is nothing new in market-led development, of course. It does raise the question of what Waterfront Toronto and Torontonians – the necessary partners (Aggarwala, 2018) – stand to gain. It is even less clear how some of the issues will be dealt with, such as algorithmic governance and corporatised public services that have been identified in scholarly circles (see above and reference list below). We will try to dive deeper into some of these topics in later entries. This article is also available as a pdf here. Thanks, Markus, for reading and pushing me on this. In a previous post, we listed some of those articles, including German sources. 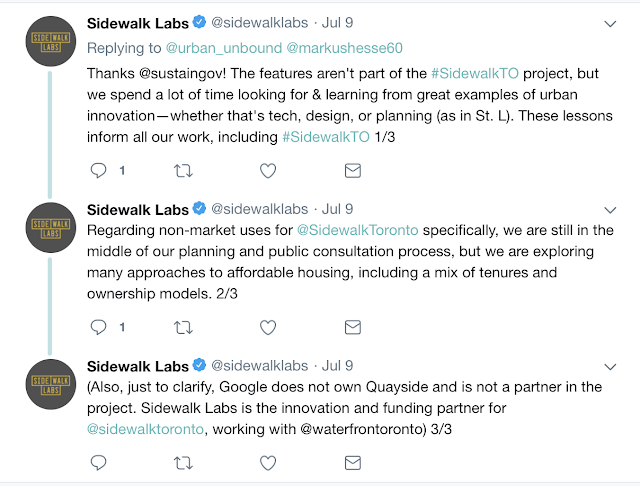 However, if you want an exhaustive list of articles, look no further Sidewalk Labs has already compiled them at their website. @Sidewalklabs, if you are reading along, please feel free to leave a correction in the comments below!! This page has easter eggs too!! Tell me if you find them. Does anyone know what GOOGL.O is? Can anyone confirm that Sidewalk Labs is part of the Moonshot Factory? August and Walks (2018:131) calculated that TransGlobe accrued a 60% return after two years. And, while winnings are in the order of millions (not billions), such practices of financialization already cause problems with respect to housing affordability in the city. August, M. and Walks (2018) Gentrification, suburban decline, and the financialization of multi-family rental housing: The case of Toronto. Geoforum, 89,124-136. Carr (2014) Discourse Yes, Implementation Maybe: An Immobility and Paralysis of Sustainable Development Policy, European Planning Studies 22(9) 1824-1840. Glowik, M. (2017) Global Strategy in the Service Industries: Dynamics, Analysis, Growth. New York: Routledge. Graham, M. and Shelton, T. (2013) Geography and the future of big data, big data and the future of geography. Dialogues in Human Geography. 3(3) 255-261. Sidewalk Labs (2017) Our Approach To Data Privacy. https://sidewalktoronto.ca/wp-content/uploads/2017/10/Sidewalk-Labs-Approach-to-Privacy.pdf (Accessed August 6, 2018).